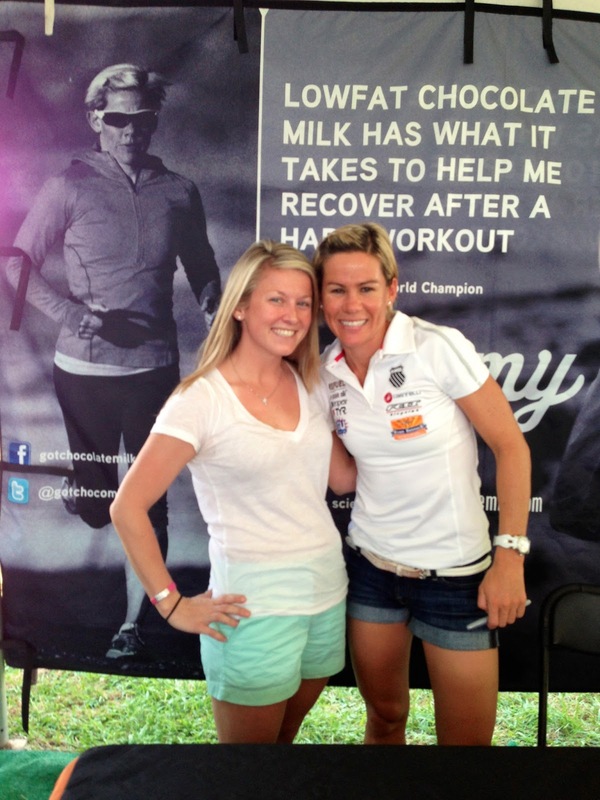 All month I was looking forward to my chance to race St. Anthony’s where my idol Mirinda Carfrae would be racing as well. And I was finally able to meet her. This was the ultimate moment. She is the reason I got into triathlons because she gave hope to short girls out there that you can compete and beat the tall girls out there. With dedication and a lot of training she went from having very little swimming background to being a World Champion and if I can have any success in this sport like her, I will be very happy. The Expo took place Saturday and we arrived in Tampa that morning. It was hot as was expected since it is Florida so I knew I had to start hydrating immediately. The expo had a lot of different stores, mostly local selling their gear and offering discounts of course. 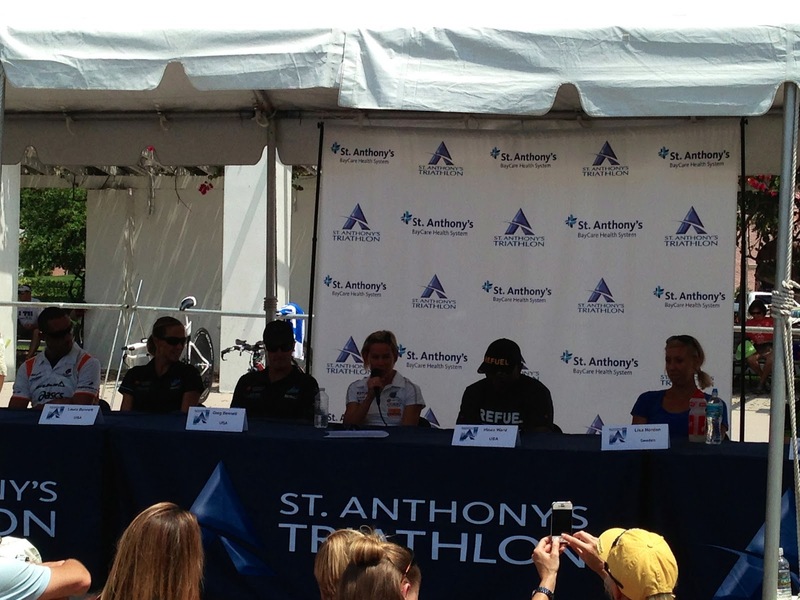 Then at noon they had the panel of Pro’s speaking which was very cool to get to see the likes of Hunter Kemper, Emma Moffitt, Laura and Greg Bennett and many others. Of course they wanted to highlight their new star Hines Ward (BLECH). But it was fun watching them speak and hearing what they had to say. Once I received my packet which was very organized and impressive I went to rack my bike. The transition area was wide but not long which was refreshing. Race day began at 5 for me as I was up and heading to the transition area. In the days leading up to the event, they told us the water temperatures were in the 80s, yet somehow race morning it was 76. Rather interesting. The waters were also very wavy and choppy which made things very uncalming for myself. After we were kicked out of transition and headed to the swim start, announcements were being made about shortening the swim after the pros went. So the swim was shortened to 750 meters but that made our transition run even longer. The swim started with us in the water and a mass start. This was the first time since Nationals where i was getting kicked in the face and climbed on top of so i tried to be a little bit more tough and pushing through this time. Because of the swim and the conditions i was in, i was using my legs much more than needed and by the time we were hitting the beach, i could barely run. This slowed down my swim time and tired me out immensely. Then came the fun long run back to transition which was supposed to be the continuation of the swim. I was in wave 7 which began at around 7:30 (thank god) because as I was finishing the bike, people were just getting back from the swim, and it was already very hot outside. Because the shortened the swim, they lengthened the transition and I should have taken off my wetsuit but I didn’t (big mistake) my legs were already so beat that this didn’t help. And I needed to catch my breath a little while getting ready for the bike. I headed out onto the bike course beat up and exhausted. So this was not the time i was hoping for but it also wasn’t my best. My legs were beat, It was hot and I tried to go faster but I couldn’t. The course has a lot of turn arounds’ and curves which slowed me down as I am still afraid to go faster around turns. I did however enjoy the aid station on the bike. First one at this distance. Their was also a lot of speed humps and the road wasn’t paved well. So those conditions weren’t enjoyable, but every 5 miles there was mile marker. I love it when I can get in and get out from the bike to the run. Short transition times make me very happy. So of course this was not my best run time but given the circumstances I was just happy to be done. It was hot, I was constantly dowsing myself with water to cool down and my legs were tired. I was averaging 8 minute miles for most of the run. There was a mile marker at every mile, a couple of aid stations and my favorite was running through the neighborhoods with everyone out handing us beads, beer, jello shots, water and very clever signs. Its moments like these ones that made the run very enjoyable. Overall, this was a very well run race as was expected with St. Anthony’s reputation. I got to meet my idol and even though I didn’t perform as well as I wanted to, It was still a great learning experience.